I make pots with personality! When I started studying for my degree in Dance back in 2010, I scoured South East London for a weekend job – and stumbled across a pottery café just outside Greenwich Market. They were looking for someone to start right away. For the 4 years that followed, I spent most of my lunch breaks painting mugs and pots. Soon enough, friends and family were putting in requests. I spent about six years in total painting premade ceramics. In 2016, I decided to pluck myself out of London and make a fresh start in Ipswich – and decided to learn how to throw pots with Karl Greene, a wonderful local potter. Since then, I’ve been primarily throwing my own pots, but I have dabbled with hand-building and am really keen to teach myself more techniques as time goes on. What makes your work and/or process unique? I feel like I’m 100% trial and error at this stage in my journey, which means that every single piece is completely different and a one-off. I plan to hone my collection as time goes on, but for now I’m really enjoying using lots of different sample glazes, creating all different shaped pots – some with faces on them, some without. What would your top tip(s) be for anyone considering taking up ceramics? Take the plunge, get started and practice, practice, practice! 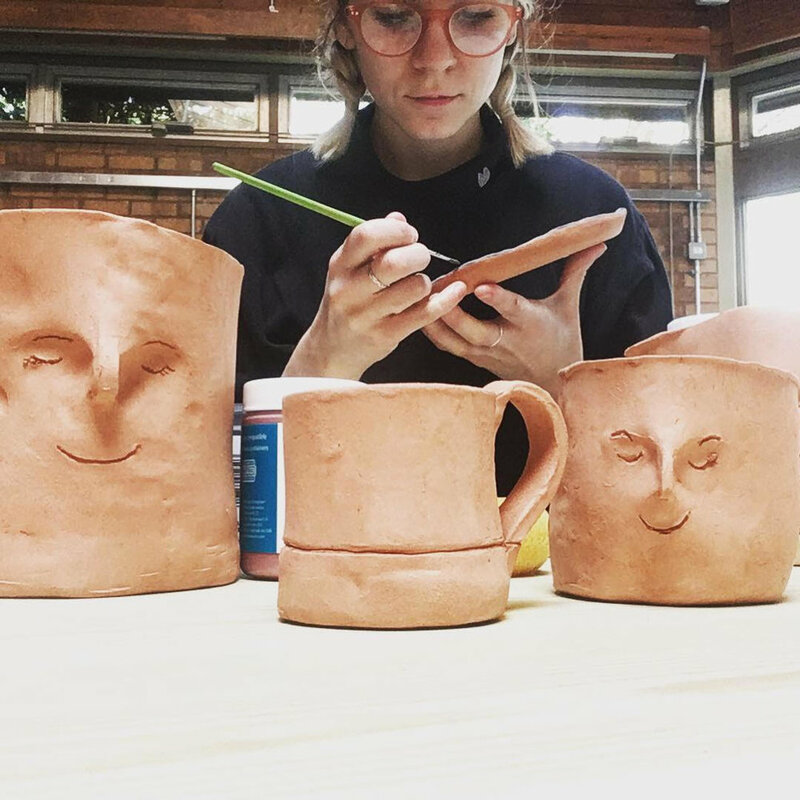 If you’re local to Colchester, my top tip would be to come along to a Clay Workshop at the Makerspace – there is an amazing community of potters at all stages of experience and it’s a great way to learn from others. What piece of work or project are you most proud of? There are definitely a few highlights of the work I’ve done so far with ceramics. I think most of them come from the custom commissions I’ve had the pleasure of working on. When I was quite early on in learning to throw, I made a set of mugs for The Nourish Co. - a vegan cafe on Crouch Street in Colchester. They weren’t my ‘neatest’ work but they were so lovingly received, which made me even more proud of that particular commission. When you have the dreaded creative block, where do you get your ideas and inspiration from? Before the Makerspace existed, I’d would go weeks without getting in a creative mode and without making anything. It was pretty hard to get the motivation, apart from going to pottery sessions every fortnight. But now that the Makerspace is running, whenever I’m feeling a little creative block I take my clay down to the studio and get on the wheel. Even if I end up with something pretty wonky, or sometimes nothing at all, it gets me out of a funk just being in the open and creative environment. What other artist or maker do you admire and why? I have always admired Rob Ryan – for the intricacy and detail of his paper cuttings, and his way of storytelling through his work. I am an avid fan of Studio Arhoj, a Danish interior design and ceramics studio. Their studio in Copenhagen is incredible – a store and open view pottery studio in one. If only they were offering internships….! Any books on your shelf or exhibitions and events coming up you can recommend? Books on my shelf – the Potters Bible! Always useful for someone at any stage in their pottery journey. If I could recommend checking out an artist whose work I saw at an exhibition I went to earlier this year… Bae Se Jin makes the most incredibly mesmerising ceramic works. I was lucky enough to catch a few works of his at Crafts Council’s Collect 2019 exhibition at Saatchi Gallery, London. Why is Colchester Makerspace important to you/or and your work? I would go so far as to say that Colchester Makerspace has kick-started my venture into turning my hobby into a potentially successful business. Without the space, I would still be without access to the facilities a potter needs; a wheel, a kiln and materials. The Makerspace provides everything at an affordable cost, and is starting to build a fantastic community of creatives. Lizzie’s work is available to buy online and for the month of April on display and available to buy at Café Saison in front of the Makerspace at Trinity Works.